But there will be many for whom the bright, shiny lights of NYC hold no attraction, and who would rather set the dials for the dark heart of Northern Britain in the early 1980s. These people will wear anything as long as it is black, enjoy nothing more than swaying to the heart-chilling sounds of The Cure, Joy Division or Bauhaus (possibly accompanied by nice pint of cider & blackcurrant juice) and can sometimes be spotted hanging out in mist-shrouded graveyards. 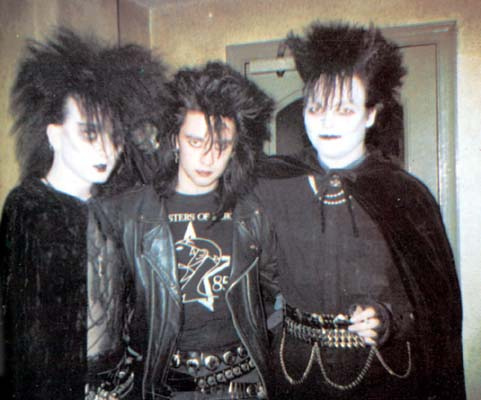 Yes, you guessed it, these people are Goths, and if you are one of them, then here’s a treat for you: three films chronicling the early 80s British Goth club scene while it was in its infancy. The received wisdom in the UK is that clubbing didn’t really exist here until after the acid house explosion in 1987/1988, with the notable exception of Northern Soul venues like The Mecca in Blackpool and the Twisted Wheel in Manchester. Well, these videos tell a very different story, displaying a flourishing alternative club scene that existed years before acid. Offering (mostly) untampered footage shot directly from the dance floors and stages of the best known Goth hangouts of the era, these films have the aura of gold dust about them. If that’s too bright and shiny for you, consider them excellent cultural curios that give a rare peek into a then-emerging subculture. These films, which vary in length from 8 minutes to over two hours, popped up on my Facebook feed this evening, so I decided to do the decent thing and group them all in a post for Dangerous Minds. via Dangerous Minds | Children Of The Night: three films about early 80s Goth nightlife in the UK. PreviousTrentemøller… sounds a lot like the Cure!